The inspiration board I made for my wedding. Birds & Feathers, Aqua & Pink! I even have a clipping from lining from the suits and swatches of the bridesmaids dresses and sash. With the absolutely overwhelming choices out there, deciding what you want for your wedding can feel a daunting task. And once you make a decision, it can seem even harder to stick to it! I felt the hardest thing about wedding planning is making decisions! If you have had a day where you can’t decide what you want, but have definitely decided what you don’t want, do not feel discouraged… this is definitely progress! 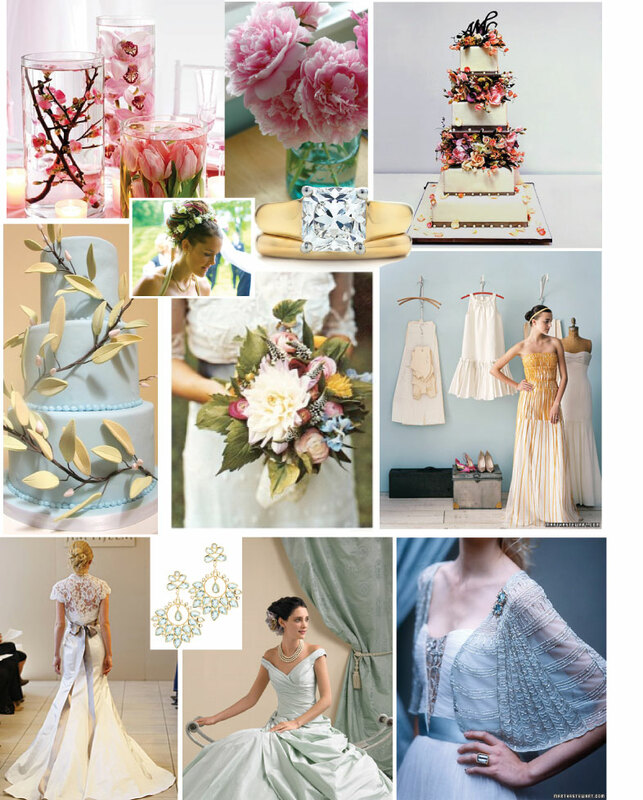 A must have on my list for wedding planning is an inspiration board. Long in use by designers of all sorts, inspiration boards allow you to visualize the look of your design. It allows you to test a new element to see the effect and determine whether it fits into your overall vision. What makes it indispensable is that it helps you narrow down all the stuff you like; for example, say you absolutely LOVE the idea of Peacock feathers but the majority of things on your inspiration board are soft and sweet and girly… you can instantly see how the peacock feathers can come off as an outlier, and you can either decide to incorporate other ideas to make these looks blend or you toss an idea you love. 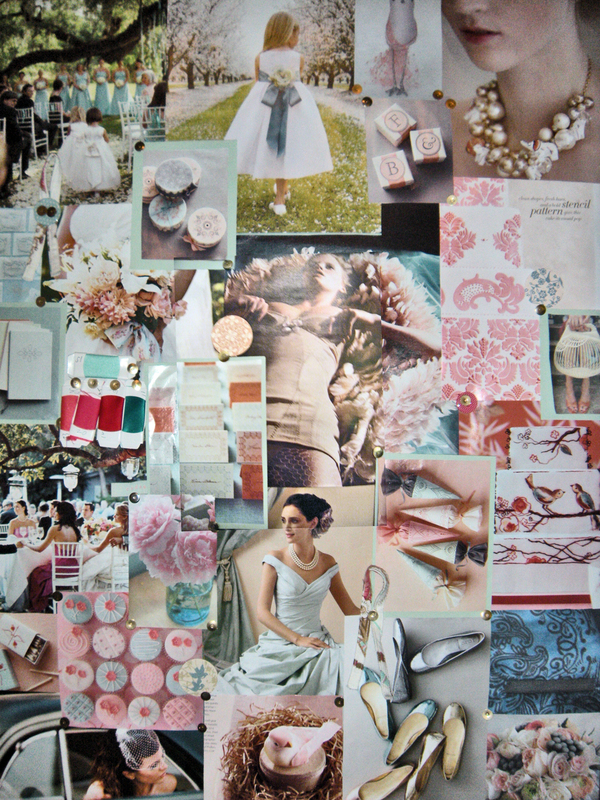 Nobody likes tossing an idea they love, but it gets you one step closer to knowing where you are going and to getting things done, so the inspiration board potentially saves you many steps to coming to that conclusion, and in the worst case scenario, saves you from realizing it on your wedding day. Say you are coming from the opposite end of the spectrum. You don’t have a lot of ideas, and you don’t feel confident in your eye for design, but you know you like the look of a well designed wedding. You just can’t put your finger on the elements that make the design as a whole. As you pull tears from magazines, and save images you like from the internet, see if you can’t discover similarities in the images. Also, absolutely do not restrict yourself to media that is specifically wedding related– ANYTHING can go on your inspiration board! Inspiration boards have yet another advantage; showing others your ideas. Say you feel very confident in your ideas, but your mother or your maid of honour may not be able to visualize your big picture. Having a collection of photos and trinkets will allow you to stop explaining with words and start explaining with pictures. And as they say, a picture says a thousand words! On a personal note, my mother (although she may deny it now) said I was crazy for wanting all of my bridesmaids in different dresses and colors, with the aqua colored sash tying everything together… and while others might not have called me crazy (to my face) I sensed a little apprehension, and even I realized it sounded a little strange. My mother also somewhat mocked my bird theme. But my inspiration board really helped the people in my life understand my complex vision, and see how everything would fit together. An older (and digital!) version of my wedding board. I included photos of my wedding jewelery, and had a bit more yellow than I ended up with. Sometimes, some of your original ideas end up by the wayside. Something that might also happen is that some of the ideas that you were so excited about when you first started planning fall by the wayside by the end of it. It happens for a few reasons, one being that you have done sooo much research you discovered what you always thought you wanted was never really what you wanted after all (I do hope that many a bride who dream of wearing a tiara later decide to switch that out for a pretty floral headpiece or mantilla veil…) And yet another reason your original vision may change over time is simple practicality. I couldn’t afford the very beautiful walnut chiavari chairs at 9$ a piece plus delivery, so that vision had to change. It’s very important to update your inspiration board often, according to what is possible. There are some distinct times when it will be easy to do this; after you have chosen your venue, after you have chosen the bridesmaids dress colors (you can try to settle on colors before this, but since you don’t exactly have all the options in the world, it can be rather difficult (or fruitless) to create and fall in love with a color scheme you can’t see come to realization); and after you plan or choose floral arrangements. Also, I must say, vendors love a bride with a binder. As a designer, if a client has something visual, you are sure there will be much less room for error and misunderstanding. You may think you have described your vision perfectly via language, but language is open to much more interpretation than a photo. Remember that when you are asking for little swirly things on your cake! And, if worse comes to worst, making your own inspiration board becomes an impossibility, check out the Inspiration Boards page on Style Me Pretty, and pick one you like! You should peep it anyway. Edit 6/21/10: Craftzine post about wedding boards.